Timbuktu's Treasures Are Being Destroyed As World Watches Helplessly : The Two-Way Muslim extremists are pillaging Sufi tombs and mosques. They're ignoring international protests. To them, the sites are offensive. To most others, they're historical sites of huge importance. This image from a video shows Islamist militants destroying an ancient shrine in Timbuktu on Sunday. Once again the world is watching with increasing alarm as religious extremists destroy centuries-old historical sites because they find them offensive. In 2001 it was the towering statues of Buddha in Bamiyan, Afghanistan, that were turned into rubble by the Taliban. Now, Muslim extremists in Mali are pillaging tombs and other sites sacred to Sufis in Timbuktu the "city of 33 saints" and a city so important to trade in past centuries that it inspired the expression "from here to Timbuktu" — a "metaphor for exotic, distant lands," as Trek Nature writes. 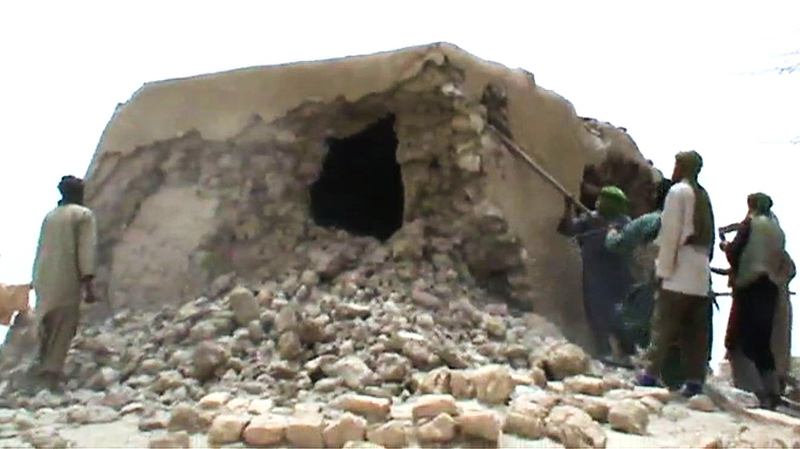 NPR's Ofeibea Quist-Arcton tells our Newscast Desk that witnesses say Ansar Dine militants have even smashed the sacred entrance to Timbuktu's 15th century Sidia Yahya mosque. Its door, local Sufis believe, must remain closed. "Tradition has it that that particular portal would only open on the last day of the world," Time magazine writes. On Monday's Talk of the Nation, Ofeibea told host Neal Conan that Ansar Dine is imposing Islamic law — Shariah — in Timbuktu and towns across north Mali "and they say that these tombs, these mausoleums of Muslim saints, are idolatrous." That's the same excuse the Taliban gave about destroying the Buddhas. "These tombs and these historic sites in Timbuktu go back to the 15th century," Ofeibea added. "So this is not only Timbuktu's history, it's Africa's history." The U.N.'s World Heritage Committee has "condemned the acts of destruction of mausoleums in the World Heritage property of Timbuktu and called for an end to these 'repugnant acts.' "
Time adds that "the International Criminal Court's new chief prosecutor, Fatou Bensouda, suggested [the destruction] should be considered a war crime. "Timbuktu is no ordinary town. The fabled 'City of 333 Saints,' is an ancient desert crossroads and a historic seat of Islamic learning and faith. "The attack on Timbuktu's cultural heritage is an attack against this history and the values it carries — values of tolerance, exchange and living together, which lie at the heart of Islam. It is an attack against the physical evidence that peace and dialogue is possible. This is condemned uniformly by religious leaders across the world. "The International Criminal Court calls this a war crime. We call it an attack against humanity. This is an attempt to isolate and exclude, to sever the ties that bind peoples together." 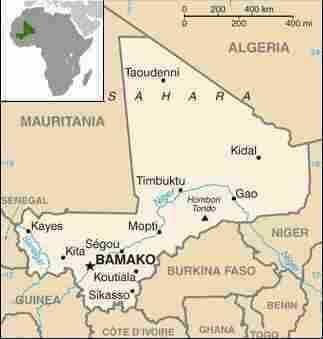 But The Associated Press reports that "reached by telephone in an undisclosed location in northern Mali, a spokesman for [Ansar Dine] said they do not recognize either the United Nations or the world court." "The only tribunal we recognize is the divine court of Shariah," Ansar Dine spokesman Oumar Ould Hamaha told the wire service. "The destruction is a divine order," he said. "It's our Prophet who said that each time that someone builds something on top of a grave, it needs to be pulled back to the ground. We need to do this so that future generations don't get confused, and start venerating the saints as if they are God."